Amsoil is about no compromises and saving you time. On our powerstroke page you will find three weights of diesel oil for the 7.3 powerstroke and the 6.0 powerstroke. For the 6.4 powerstroke and the 6.7 powerstroke we have two weights of CJ-4 synthetic oil. In the table you will find a the best oil filter for powerstroke engines listed by size. You can click the number to read more or just order. Furthfer in the table there is a listing for the best bypass filter for your powerstroke. 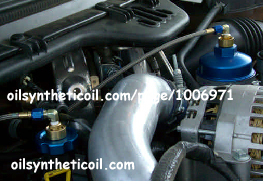 There is a cold air induction system by injen to improve your power also. diesel oil for the there are two weights. We have bulk oil pricing. For the best price for your order now please go here. Non-CJ-4 there are two weights. 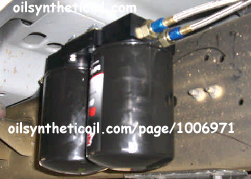 We have bypass filter installation instructions for the best bypass filter for your powerstroke, and we have pictures of actual installs.For more pictures of bypass filter intalls on powerstroke units please go to our installs table on the bypass filter page. To find product for your Powerstroke now click to link to the application guide (filters and fluids capacities are listed also) just start with the year of your vehicle. There you can find capacities, toques, and all our products for your Engine , transmission and air filters. We carry a full line of product for the Powerstroke line. The easiest way to find it all is to click the online appication guide above. Below I have built a basic table for quick order of oil and filters.s If you have questions please call me (Santana ) call/txt 860 436 7034. If you know your product code ( the three letters )Click the price button next to it, then add to cart. Add prefered customer to cart and get instant savings of 25% -35%. All sizes are available quarts to 55 gallon drums, you can select the size once you go to the price page.. Local pickup is available at many US locations and several Canadian locations. You can call me for the location nearest to you. I would be glad to give you a quote over the phone or walk you through all the options. When you click this picture shows an amsOil BMK21 bypass filter kit installed on a ford powerstroke F350 . The picture shows the nice anodized amsOil BK1101 filter cap and the BK1102 oil return cap replacing the standard oil fill cap on a ford powerstroke. Those anodized caps really dress up your powerstroke unit. Both anodized caps are shown with the optional BP242 swivele fitting. The contents of the BMK21 bypass oil kit are listed here. 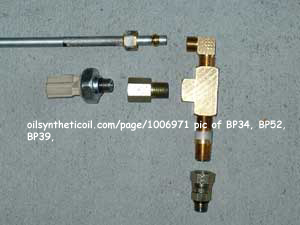 When you click this picture you will see amsOil bypass filter kit fittings BP34, BP 39, BP52 your existing pressure transmitter would thread into the T ( the brass fitting ). The amsOil bypass filter kit BMK 21 includes those three parts I just included this picture to give you a visual of how it goes together. 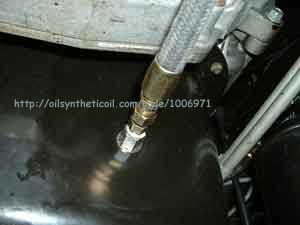 When you click this picture you will see a bypass filter kit hollow bolt installed in a powerstroke oil pan. It is the BP40 self tapping hollow bolt which which is item number 15 on the bmk21 PARTS list.